Mostly cloudy skies today with a few small breaks in between them. It was not enough to capture the prominences today, but I managed to capture 700 frames (stop and go), sufficient to produce this image. There are more sunspots now, but the activity is still relative low at the earth side of the sun. A clear sunny day again. It seems a bit quiet, but if you look closer at the region1408/10 there are a good number of little flares. Also in the southern hemosphere there are two large structured areas. The prominence at the western limb has disappeared, probably turned to the back of the sun. 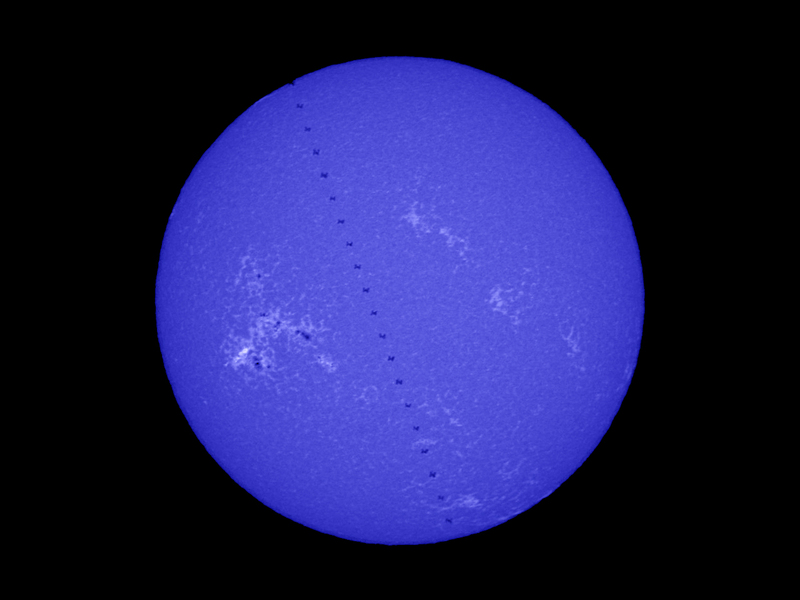 Today a full disk and closeup of AR1410/13. A week and a half ago I received a request from someone in Ohio whose son was doing a school project on the Sun. 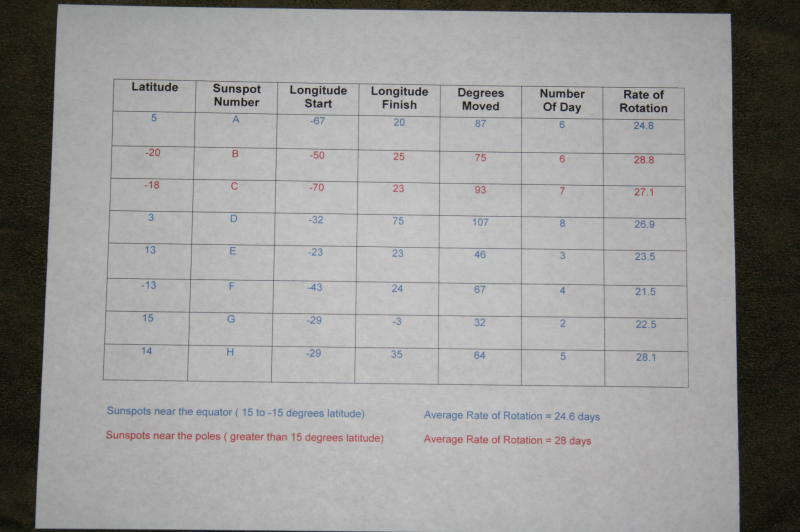 He wanted to measure the locations of Sun spots on different days and measure how they changed over time so he could calculate the rotation period of the Sun. In order to do so he asked for permission to use some of my images. Now everyone knows that you can use my images for any purpose, and I submit my images to the Association of Lunar and Planetary Observers, but this request for a student project made me really feel great! 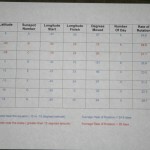 Today I received the final version of the data he measured and used in the project and I would like to share this with everyone. Congratulations Mickey with this project, and thanks for allowing me to share it here. You did a real great job at this!! A nice clear day again to image the sun. Only two major active regions 1408 ans 1410. It seemed more quiet than yesterday, but I observed a few small flares around AR1410. A nice prominence at the western limb made a nice display. Today a full disk image and a closeup of regions 1410 and 1408. A clear day again to image. It turned out that when I was imaging the closeup of active region group 1410 this morning, a C1 flare erupted. It is exciting to see how much activity we have had this week even if the number of sunspot groups has gone down. It seems that the active regions are getting stronger in activity. The second day of our outreach event for HTE I had a little more time at home and was able to put in a imaging session before leaving. The active region 1401 and 02, which showed a brilliant display of fireworks on Chinese New Year, is quickly approaching the Western limb, while the NE limb is showing a tall prominence. 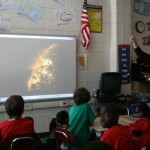 Tuesday we did the first of a two day solar event at Hightower Trail Elementary in Conyers. Great students and teachers! The students saw the sun, the active region which produced the largest CME impact since 2003 and learned about the satellites that help us study the sun. Back on Wednesday for the second day and Friday for the 8th Space Camp at Hightower. Last summer, Romaine and I went back to upstate New York to visit relatives and friends. It allowed me to reconnect with some old friends, Carol and Chuck Higgins, who are members of the Mohawk Valley Astronomical Society and I did attend one of their meetings while I was there. See my blog for this by clicking here. Earlier this week I rreceive an email from Chuck in which he attached an image that he and Carol made on 1/19/2012 of an ISS – Sun transit. 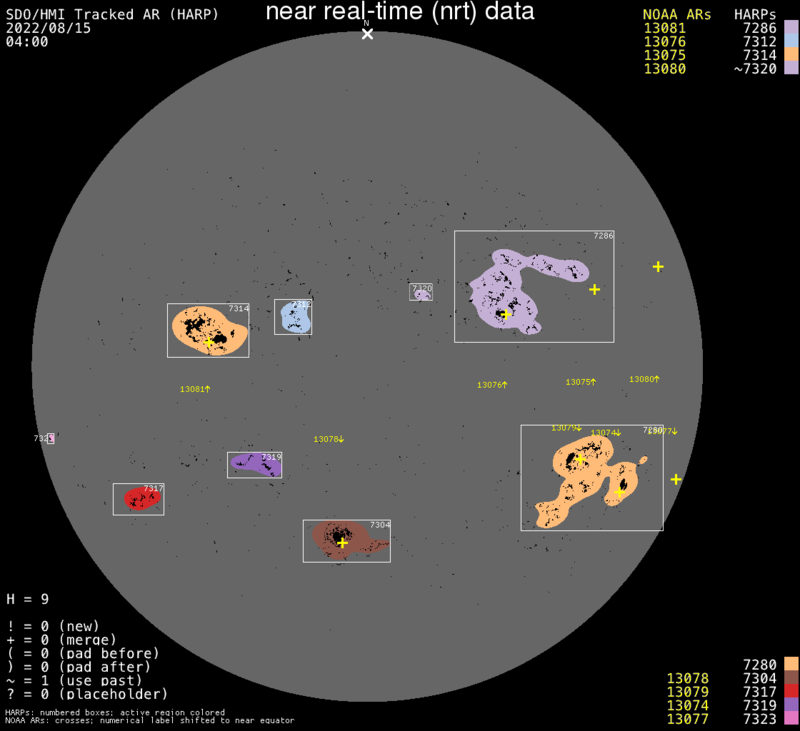 I like this image because it is very nice and there are not so many transit images that show transits in the Calcium-K emission line. In the winter with the low sun, these transits usually happen at larger distances, so I think they did a fantstic job with this. Congrats Chuck and Carol!!! Click the image for the larger version. Image by Chuck and Carol Higgins. Broken clouds today. Active Regions 1401, 02 and 05 are crackling with activity. 1402 showed a great flare, but the clouds did not allow me to image an animation. I wonder if we get to see some fireworks here. Today’s image a full disk image of the sun as well as a closeup of the AR1401,02 and 05 group. When I got up at 6 this morning, Spaceweather was already advertizing the large prom at the NW limb so I could not wait to take a look. 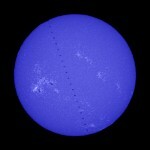 But when the sun cleared the walls at 10:30 I did not see anything except 3 small proms. It turns out it left the sun around 8 our time. I wonder if anyone was able to image it. The group AR1401, 02 and 05 is developing in a nice and interesting group worth keeping an eye on. Today a full disk image and close up of this trio.